DorkySon is pretty steady on his feet these days. He only does a face-plant every so often when he’s tired or overexcited, so we decided it was time to let him explore a whole new way of injuring himself – on a bike. On the Saturday that I was in London for the Save the Children conference, the two DorkyBoys headed off to the Harpenden Cycle shop and returned with a snazzy little blue number, along with a truly lovely multicoloured helmet. Thank goodness for that helmet, which has already saved his wee noggin at least half a dozen times. The first time poor DorkySon climbed on the bike, at the top of a very gentle slope, he was full of smiles and big boy cockiness. By the bottom of the slope he was a wailing, grazed and very grumpy heap on the ground. We pulled the bike off him and persuaded him back on. That was a couple of weeks ago now, and I think it’s fair to say that progress has been steady, but slow. It is brilliant seeing him having so much fun – we have finally found an outdoor activity that he is even happy to do in the rain – but bless his heart, he’s being a wee bit premature in his confidence. He is good at riding his bike… as long as you take into account the fact that it usually takes several attempts to get on the thing. And he can’t steer yet. Or pedal. The one thing he has mastered is pulling the brakes, which he usually does without warning when I’m bent double pushing him along. My legs have taken quite a battering from those sharp wee pedals crashing into them every time we do an emergency stop. A few days ago, when DorkySon was sitting on a bench having a ‘bike rest’, another wee boy came running up and asked to have a turn on his bike. To our surprise, DorkySon said yes. To our even greater surprise, this other boy, who was at least a year younger, hopped straight on and started pedalling round in a circle with great proficiency. I am no pushy parent. He can take as long as he wants to master the art of cycling. But I hope – for the sake of my shins, my back and my nerves – that it happens sooner rather than later. Just a quick note since you’re reading anyway to say thank you very much indeed for all your votes in the BritMums Brilliance in Blogging Awards. I’m absolutely thrilled to pieces to be a finalist in the Fresh Voice category. I can’t tell you how much I appreciate all your support, so thanks again! 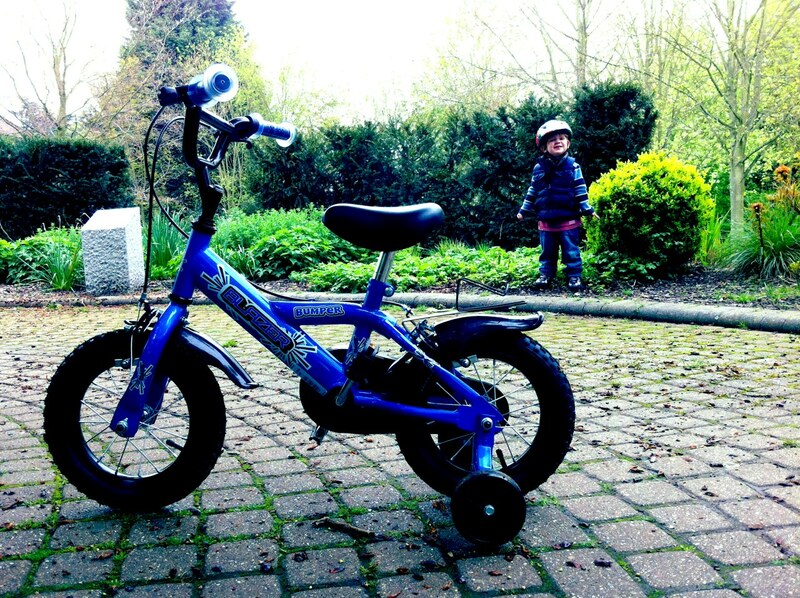 Did you give balance bikes a go first, or straight to the real deal? We went straight for the real deal. He had a scooter before, but didn’t really bond with it, and he has been using the trikes at nursery. Are you going to cycle with the Creature on the back of your bike? Thankyou! It’ll be a while before we can get him out on the roads I think! 🙂 He thinks he is very cool indeed! Love the photo. Sounds like Dorky Son is making great strides. Congratulations on becoming a finalist! Well done for you reaching the finals, me too! I’ll see you there? Amazing work on the bike riding, and that’s the nicest bike I’ve seen so far. I want to get one for The Boy for his birthday, where did you get it please? Oh I have run behind so many bikes and trikes in my time! Don’t wish the time away it is special, when he is cycling off alone you will remember this fondly! Many congratulations on your BIBs finalists position, so well deserved. Thank you for linking with me on Country Kids. I’m not very good at it myself, I’m afraid!! Ah bless ! Go Dorkyson, go! Phew, I wish he would!